That’s just a tiny fraction of the cost Wisconsin pays for the sport of running dogs on bear. Let’s not forget the costs for wildlife; the bear cubs separated from their mothers, foraging black bears are kept on the move, and how about the White-tailed deer forced to protect her fawn from packs of free roaming hunting dogs in pursuit of bear. What could be causing the high deaths of hunting hounds? Dogs may be trained statewide by pursuing bear from July 1 through Aug. 31. Lisa Makarrall, Wolves of Douglas County Wisconsin researcher, obtained the 2016 Wisconsin Department of Natural Resources Wolf Depredations Payments list. Are Marne Gall & Leon Gall related? When you google a Marne Gall she comes up as from a Pierz, Minnesota. 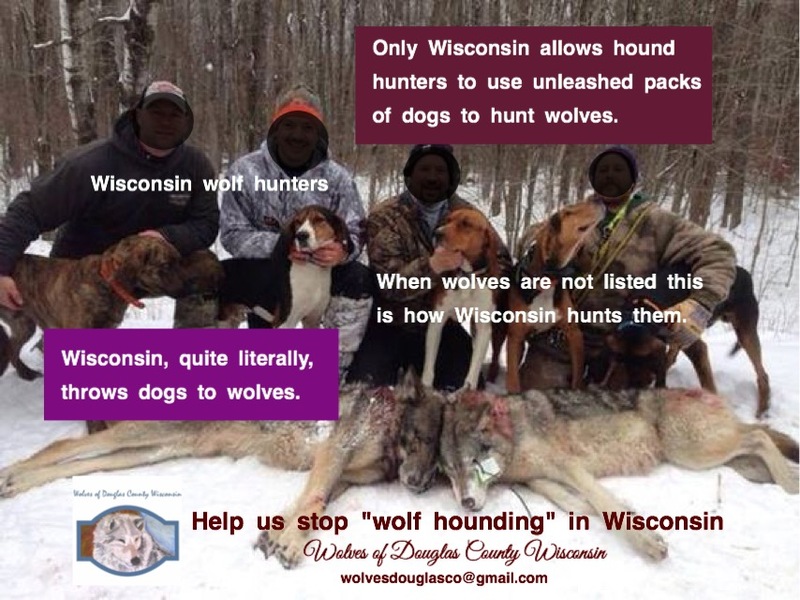 When the sport of pursing bear with dogs began in 1963 wolves were all but eradicated in the state of Wisconsin. How many more lives will be lost in pursuit of bear before Wisconsin residents say enough is enough. This conflict between bear hunters and wolves continues in the north woods of Wisconsin, and now has become one of the reasons Wisconsin legislators want to delist wolves. Wolves are an imperiled species, that are a part of Wisconsin’s wild legacy, and are being pushed to the brink of extinction; by conservation policies that favor a group of fringe hunters. These special interest, fringe hunters take advantage of the current political environment. They cause harm to wildlife by the “loosening” of regulations; they pushed for the removal of the Class B bear training & hunting licence that allowed for an undetermined number of dogs running through wolf habitat. That could definitely be the cause of the 37 bear hunting dog deaths. Wisconsin taxpayers should NOT be forced to bankroll someone else’s hobby! “Natural” predation is one thing; by all means keep reimbursing farmers for livestock kills, but dogs killed while hunting? The hunters put their dogs at risk; therefore the responsibility should be theirs alone.